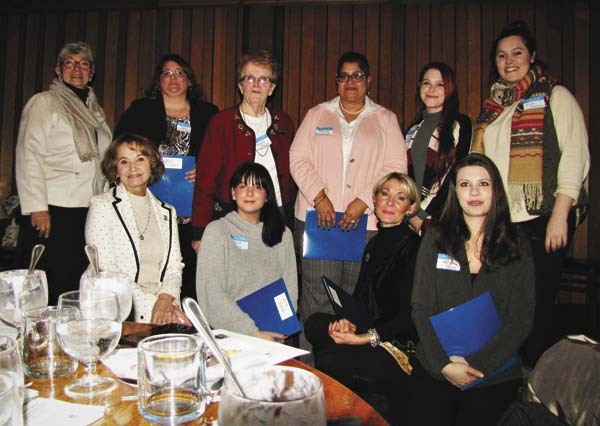 PERTH — Eight new members recently were inducted into the Soroptimist International of Fulton and Montgomery Counties at Raindancer Restaurant. They are Darci Luci, controller at Century Linen in Gloversville; Yvonne Major, prevention educator at HFM Prevention Council in Johnstown; Sara Schrum, marketing assistant at Nathan Littauer Hospital; Robyn Valentine, owner of Robyn Dees Hair Design; Lisa Johnson, a Johnstown school teacher; Kaleena Young, human resources representative at Century Linen-Commercial Laundry; Erin Salie, funeral director with Betz, Rossi, Bellinger and Stewart Family Funeral Homes in Amsterdam; and Elaine Santiago, senior consumer engagement specialist at Beech Nut in Amsterdam. The induction was conducted by membership chairwoman Ruth Drake, and the meeting was led by chapter president Cindy Close. The new members were given Club pins. Anyone interested in becoming a Soroptimist member may contact Sandy Peters at (518) 725-8861 or message it on its Facebook page.